Bouteflika's newly appointed deputy prime minister, Ramtane Lamamra, has launched a tour of allied countries seeking support. He visited Moscow on Tuesday, where Foreign Minister Sergei Lavrov said Russia, a close military ally of Algeria, was concerned about attempts to destabilize the situation. Lamamra defended the government's reform proposals. Bouteflika has agreed to hand over power to an elected president, and the opposition will be allowed to take part in the cabinet that will oversee elections, he said. For years, rumors have swirled about potential successors to Bouteflika, but no one credible has emerged who has the backing of the army and elite and is not in their 70s or 80s. In their statement, the protest leaders made veiled references to two figures: Bouteflika's powerful younger brother Said, and the president's friend Lakhdar Brahimi, a veteran Algerian U.N. diplomat named by Bouteflika to chair a conference to develop a new political landscape. 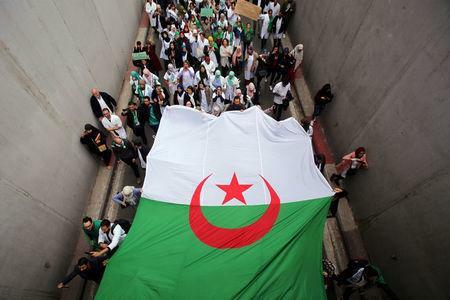 "The Algerian people will not accept any approach that will tend to extend the current system, whether from the 'brother' entourage or the 'friend'," the protest leaders said. With memories of the 1990s civil war which cost an estimated 200,000 lives, many Algerians have long prioritized stability. Bouteflika survived the 2011 "Arab Spring" that toppled other Arab leaders. But with the economy souring and the youth less fearful of change, he has struggled to placate Algerians.